Characters on Heroes and, as such, Heroes MUSH, love waffles! Waffles are a recurring theme on Heroes and they've made their way here. Take a look at these tasty breakfast delights at any time of the day. Every Wednesday is Waffle Wednesday. Think You Know Your Waffles? Some folks have waffles at Oldcastle's on Sunday morning. Peter takes Claire to Lucky Joe's diner and has blueberry waffles with a side of raisin toast. Peter gives Mara some waffles to go. Jack takes Tamara out for dinner/breakfast and tries to understand a little more. She has waffles. Candy makes very sugary, chocolatey waffles for her and Jaden. Mara and Nathan have waffles outside Schenectady. Nathan and Heidi have waffles for dinner. Elena makes the Petrellis breakfast and is interrupted by a drug-addicted Jack. Peter and Elena (mostly Peter) make waffles for everyone at the Petrelli mansion. Waffles are still a comfort food in a Dark Future. A few years in the future, the Saints have an elaborate breakfast, including waffles. Hiro is eating waffles when Rochelle calls. Rochelle and Hiro meet face to face over waffles. Hiro eats waffles while Charlotte works at the diner. It's robbed, but there's a hero afoot! Gabriel and Elle happen to meet Hiro at an International House of Pancakes and enjoy waffles before Peter falls from the sky. McAlister encourages Sophie to try the waffles at Lucky Joe's. Sophie orders some ever popular waffles. Hiro, Gabriel, Peter and Elle discuss their plans for Pinehearst. Waffles are involved (in the planning, not in the plan). Kory works out some of her post-kidnapping-and-stalking issues over waffles with Sophie, Hiro, Randall and Lee. Sophie and Kory plan over waffles. Sophie really likes waffles! Here she is eating them again while a human lie detector wins some bets at Lucky Joe's. In a dream, Kory turns Claire's breakfast into waffles. Gene orders waffles while talking to Sydney about a dangerous world. Nathan (AKA Brayden) craves waffles, which leads to meeting Charity at an IHOP in Washington, D.C.
Nathan (still AKA Brayden), this time in NY, is forced to begin facing his demons when Noah and Kitty recognize him. Over waffles! In a flashback, Niki is about to make waffles when she's interrupted by D.L. discovering Micah's heroic pasttime. Later, Micah and Cam decide to finish making the waffles. Sydney attempts to make waffles for Jamie while the pair are fugitives living with Fred, but only makes a mess. A plan is then hatched as Fred makes waffles. Waffles are talked about almost as much as they appear in scenes! Places waffles have been served on Heroes MUSH: IHOP, Lucky Joe's Diner, the Petrelli mansion, the Bennet household, Oldcastle's Pub & Restaurant and more. 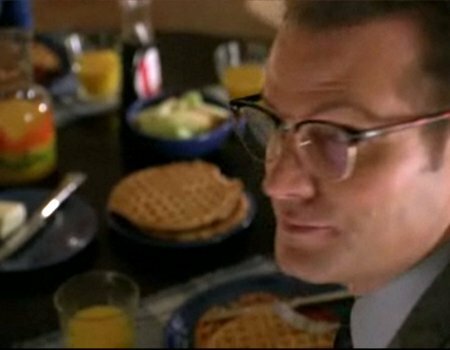 The first appearance of waffles on Heroes was in Season One's "Collision" at the Bennet breakfast table. See this page's inspiration on HeroesWiki for more (may contain spoilers). 'Waffles' is Maggie's safe word. Check out +help +waffles in-game for a way to give fellow players tasty kudos for being awesome.